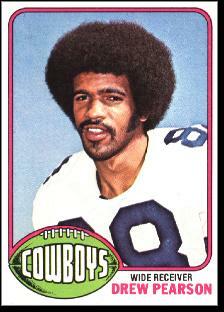 Drew Pearson was born and raised in South River. He attended South River High School, where he played varsity football with Joe Theisman. After Theisman graduated, Drew played quarterback for the Rams as a junior and senior and accepted a football scholarship from the University of Tulsa in 1969. Pearson played quarterback as a college sophomore and flanker as a junior and senior. The team featured a run-oriented offense; during his college career drew caught just 55 passes, though he did average more than 20 yards per catch. As a senior, Drew was named the school’s outstanding athlete for 1972. During Drew’s sophomore year, he met Marsha Haynes, who was visiting the campus as a high school junior. They were later married. Marsha’s father was Marques Haynes, the Harlem Globetrotters legend. During the 1973 NFL draft, not a single team called Drew’s name. The Dallas Cowboys signed him as a free agent and invited him to summer training camp. He made the club and caught 22 passes as a rookie for Dallas, which made it all the way to the NFC Championship Game. In 1974, Drew led the team with 68 catches and was one of only two players in the NFL to amass over 1,000 receiving yards. He also caught one of the team’s most famous game-winning touchdown passes in the Thanksgiving Day game against the hated Washington Redskins—a bomb from backup QB Clint Longley. The Cowboys went all the way to the Super Bowl in 1975, with Drew once again their leading pass-catcher. His most famous moment as a pro came in a playoff game against the Vikings that December. Dallas trailed 14–10 with time running out when Roger Staubach heaved a “Hail Mary” pass from his own end of the field. Drew outmaneuvered two Minnesota defenders to reel in the pass, and darted into the end zone to win the game. One week later, he topped 100 yards in the NFC Championship Game victory over the Rams. His 29-yard TD catch in the first quarter of the Super Bowl gave Dallas an early lead, but the Steelers came back to win the game 21–17. Drew got his championship ring two years later when the Cowboys defeated the Denver Broncos in Super Bowl XII. He led all receivers with 5 catches during the game. The Cowboys returned to the Super Bowl the following season, but lost again to the Steelers. Drew caught four balls in that game. Drew was almost the hero of the 181 NFC Championship Game. After Joe Montana connected with Dwight Clark for the go-ahead touchdown, Drew caught a pass from Danny White and nearly bulled his way into field goal territory. A desperate, one-armed tackle by Eric Wright saved the day for San Francisco. Drew played two more seasons before retiring. He caught 489 passes for the Cowboys and was named to the NFL’s All-Decade Team for the 1970s. He was a first-team All-Pro in 1974, 1976 and 1977, and played in the Pro Bowl those three years. After leaving the NFL, Drew forged a second career in sports marketing and also did extensive broadcast work. As of 2011, Drew had not been enshrined in the Hall of Fame, making him one of the most talented players on the outside looking in.